Jenna Levine knows a lot about food and a lot about beauty and a lot about the way the two things influence and affect each other. Certified in California Native Plant Botany and Herbal Medicine, and having spent time studying with a naturalist in the Amazon as a teenager, it makes sense that she has a line of natural beauty products called Linné that are built to nourish your skin. Today, she’s sharing a few recipes that are as delicious as they are beneficial for your body. We had Jenna breakdown the importance and effectiveness of a few of the key ingredients (only a few, but there are many!) from fruit to fish to fancy nuts grown in Peru. Her approach to food is a reminder just how versatile and abundant eating for health can be. 3 cups of sushi grade rice cooked al dente, I prefer sprouted brown rice with the addition of mixed grains like barley, red rice, wild rice, and rye berries. Divide the cooked rice into plates or bowls. 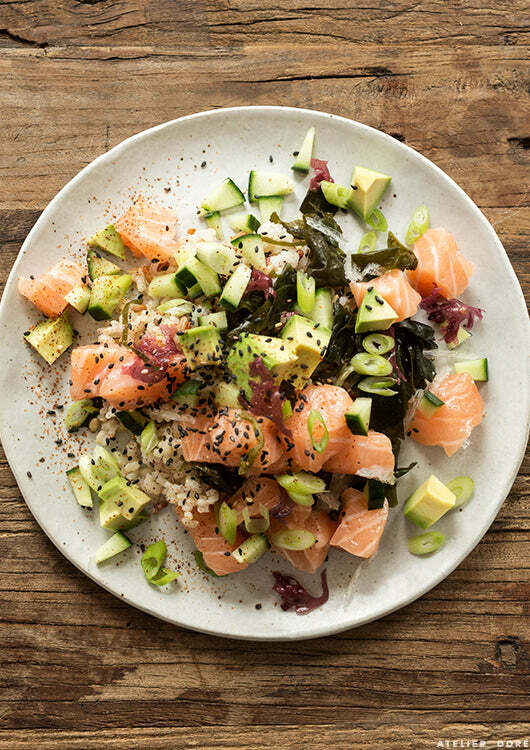 Arrange salmon, seaweed, cucumber and avocado on top of rice. Scatter scallions and shiso leaves. Sprinkle with sesame seeds. Season to taste with soy sauce, rice wine vinegar, lemon or yuzu juice. Salmon – Excellent source of omega-3 fatty acids which are important for brain development, immune system function and blood pressure regulation. A source of antioxidants, vitamin b12, vitamin d, protein, phosphorus, and potassium. Whether line-caught or farmed please ensure your source is sustainable. Shiso – Shiso leaves are used in Chinese herbal medicine for symptoms of asthma and cough. They contain calcium, iron, and vitamin C. Additionally the seed produces an antibacterial and anti-inflammatory oil that is great for blemish prone skin. Sesame – A good source of calcium, magnesium, iron, phosphorus and dietary fiber. Eating sesame seeds and oil can help lower blood pressure, improve digestion, help cure sleep disorders, and boost respiratory health. Coconut yogurt: Coconut milk can help lower cholesterol and blood pressure, provide a source of electrolytes and improve digestion. Even though it’s dairy-free, coconut milk is a good source of bone-building calcium. When fermented with gut-friendly bacteria, coconut milk will help to maintain intestinal health. Restored gut health can help resolve skin disorders from acne to eczema. Do make sure you coconut yogurt is sugar-free, and preferably full fat. Sacha Inchi Seed – The seeds of this Incan super food are rich in Vitamin E and are special in that they are regarded as one of the most concentrated sources of plant-based Omega-3 essential fatty acids. They contain a unique balance of Omega 3, 6 and 9 essential fatty acids – all of which are essential for brain health, reproductive health, reducing osteoporosis, and weight loss. They are a delicious culinary treat and also make a luxurious beauty oil. The fatty acids present in Sacha Inchi provide relief of itchy, scaly, irritated skin and the content of Vitamin A is beneficial in the treatment of acne and blemished skin. Papaya – Improves eyesight and reduces macular degeneration. Helps to reduce the arterial plaques that can lead to heart attack and stroke. Papain, a super enzyme, helps to improve digestion, cleanses the digestive tract and when applied topically dissolves dead skin cells. On the subject of good food, our friends at L’estudio (who, like Jenna, make delicious, healthy fare) generously loaned us their hand made ceramic dishes for this shoot, because (also like Jenna) they’re super kind and super talented.